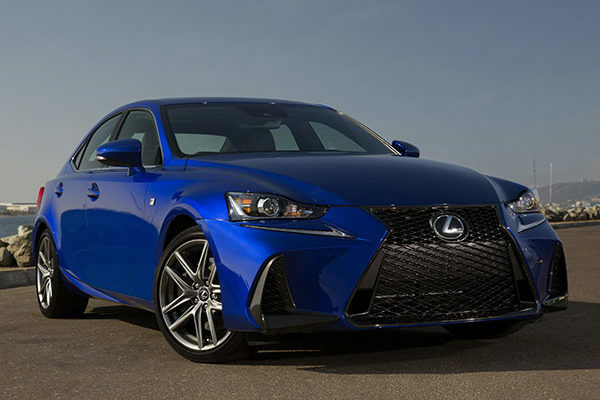 For 2018 the Lexus IS gets a small increase in horsepower, and the model names simplified to IS 300 and IS 350. The Lexus IS might be called a sport compact luxury sedan, because it pretty much covers all those bases. It comes as either rear-wheel drive or all-wheel drive, and with a turbocharged four-cylinder or V6. For 2018 the IS F Sport model gets a standard Torsen limited-slip rear differential. Other changes to all models include a rearview camera and available Adaptive Front Lighting System. The Lexus IS is a tidy size for a luxury car, so the cabin is tight, not cramped but far from spacious. When it was redesigned in 2014, the wheelbase came out at 110.2 inches, significantly shorter than rivals like the Mercedes-Benz C-Class and BMW 3 Series. The IS 300 RWD uses a smooth 2.0-liter twin-scroll turbocharged four making 241 horsepower and 258 pound feet torque over a wide range, from 1650 to 4400 rpm. Variable Valve Timing intelligent-Wide (VVTi-W) allows the engine to switch between the Otto and Atkinson combustion cycles to maximize efficiency. The D-4ST fuel injection system combines high-pressure direct fuel injection with low-pressure port injection. The IS 300 RWD uses an eight-speed Sport Direct Shift (SPDS) automatic transmission that integrates the advanced G-force Artificial Intelligence (G-AI) system to choose gears intuitively. Paddle-shifters are optional, but it seems they should be standard, if Lexus doesn’t want to waste all this technology. The IS 300 AWD uses a V6 engine. It’s a 3.5-liter making 260 horsepower, which is just 19 hp more than the turbo four, but less torque at a higher range: 236 pound-feet at 2000 to 4800 rpm. Considering how smooth the four-cylinder is, and the fact that it’s lighter over the front wheels, it’s easier to drive around town than the V6. The IS 350 takes that V6 and pumps it up to 311 horsepower and 280 pound-feet of torque. The rear-wheel-drive model uses the eight-speed SPDS transmission, while both the IS 300 AWD and IS 350 AWD models use a six-speed automatic. The all-wheel drive system is designed to deliver traction and grip in inclement conditions, and for better cornering. It varies front-to-rear torque distribution from 50:50 to as much as 30:70. A Drive Mode Select system features up to five driving modes to tailor the car’s combination of economy, comfort, performance and handling characteristics. All IS sedans feature ECO, NORMAL, SNOW and SPORT modes. Equipping the IS 300 with the F SPORT package also adds Adaptive Variable Suspension (AVS), controlled with SPORT S, SPORT S+ and customizable drive mode. There’s an F Sport package for each model, that makes the appearance, handling, throttle and transmission tuning more aggressive. The NHTSA gives the Lexus IS five stars in overall safety, with four stars for front-impact crash protection. The IIHS gives it a top Good rating in most tests, with headlights earning a Top Safety Pick award. Both engines of the IS take premium fuel. The IS 300 RWD gets EPA fuel-mileage scores of 22 mpg city, 32 highway, 26 combined. The IS 300 AWD with its V6 engine gets 19/26/21 mpg, same as the IS 350 AWD with 51 more horsepower. Go figure. The IS 350 RWD gets 1 mpg more than the AWD. The rear-wheel-drive Lexus IS 300 ($38,210) comes with the 2.0-liter turbocharged engine. It comes standard with leatherette upholstery, a 7.0-inch infotainment screen, Bluetooth connectivity, keyless ignition, moonroof, LED headlamps, steering-wheel audio and phone controls, Siri Eyes Free for Apple iPhones, and 17-inch wheels. The IS 300 AWD is $40,660, and the IS 350 AWD is $43,995. Options include blind-spot monitors with rear cross-traffic alerts; navigation with a 10.3-inch infotainment screen, 15-speaker Mark Levinson sound system, real leather, and heated steering wheel. The F Sport package includes adjustable dampers (IS 350 only), power adjustable front seats, aluminum pedals, upgraded instrument cluster, 18-inch wheels, silver interior accents, unique front and rear bumpers, and a sound composer for interior engine noises. The trademark Lexus spindle grille is large and expressive, as they all are. The stance of the IS model is purposeful. Angular lines wrap around the front end, and continue in lean and graceful curves down the sides and around to the rear deck. The cabin’s strength is its upscale design, along with the quality of the materials and the fit and finish. The plastic, rubber, and leatherette feel durable. Visually, the cabin feels like it came from a car costing twice the price. Maybe it’s the analog clock. Never mind that, functionally, the climate control instruments feel like they came from a car of 20 years ago. The 7.0-inch infotainment screen contains the Lexus app suite called Enform. It’s old school and we’re not fans. The inverted mouse used for navigating the infotainment is infuriating and distracting to use while driving. It’s a hapless haptic interface. And we say bah, at the lack of Apple CarPlay and Android Auto. There are knobs and dials for most functions, including volume and tuning for the audio system. But the climate controls use touch-sensitive sliders, which are finicky and can’t be used at all with gloves. The front seats have ample but not generous space. The tunnel that surrounds the mechanicals of the all-wheel-drive models cuts into the front footwells. With the sunroof, head room is just acceptable. The base seats feel comfortable enough for long highway drives; it’s the F Sport seats that truly hug your frame as you slide into them. Although large adults might find that hug too tight. In back, the Lexus IS offers slim knee and shoulder room. It’s as wide as the Mercedes C-Class and BMW 3-Series, but its wheelbase a bit less, and that shows in rear legroom, which is about three inches less than those two, at 32.2 inches. The IS technically seats five, but three adults in the rear isn’t going to happen for very long. The trunk is 13.8 cubic feet, more than the C-Class but less than the 3 Series. The IS 300 RWD with its 2.0-liter turbocharged four-cylinder makes 241 horsepower, about the same as its competition from Audi, BMW, and Mercedes-Benz, although from zero to sixty, it’s about a half-second slower. The extra weight doesn’t help, nor does the 8-speed transmission, as it’s not a great combination with the engine. Without using the paddle shifters, even with 258 pound-feet of torque, it lags. And we ran into some transmission stutters going up hills; the transmission hunted for gears, forcing use of the paddle shifters to find them. The V6 engine in the IS 300 AWD makes just 19 more horsepower, so it seems the main reason to upgrade would be to get all-wheel drive, which comes with the 6-speed automatic that we found to be smooth and functional. If you’re looking at the 311-horsepower IS 350 because it’s the highest performer, with rear-wheel drive and the 8-speed, you should know that it’s no Mercedes C43, BMW 340i, or Audi S4. Not with its modest 277 pound-feet of torque, nor even with the F Sport package, which it needs to be considered a sports sedan. It’ll do zero to sixty in less than six seconds. Beyond the cosmetic things, the F Sport brings an adjustable suspension and a sharper throttle and transmission in its Sport+ mode. It unlocks the car’s potential, and makes the eight-speed shift smoother and quicker. The Lexus IS comes close in a lot of areas, but then it falls short. The four-cylinder engine is strong but its 8-speed transmission slips. The cabin is lovely but the controls are not, and the sedan’s rear seat is cramped. The highest-performing V6 is not a sport sedan on the level of its German rivals.